David Dalby was a member of a large Yorkshire family, many of whom were painters. In 1815 Dalby was living in York and was listed in the local directory as an animal painter living outside of Micklegate Ban. Sometime between 1815 and 1826 Dalby left York and moved to Leeds, possibly due to his having offended the local sheriff with a libelous caricature. He returned to York in 1826 and married a local woman named Margaret and established residence at 11 Mint Yard. The couple had a son (born 1826), who would become an artist, and a daughter (born 1834). 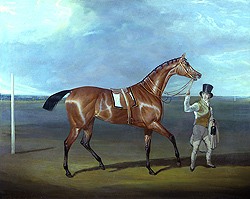 Dalby painted in an accurate, highly finished, manner and was at his best in the 1820s. 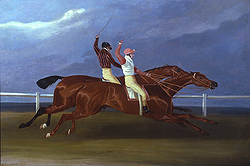 His range of subject matter included hunting, racing and equestrian portraiture. Sir Walter Gibley, a renowned 19th century collector of equestrian art wrote the following about Dalby: We see, by the manner in which he puts his men in their saddles that Dalby himself was a good huntsman; he also understood fox-hunting and could prove his knowledge on his canvas. Herring knew more of coaching than of fox-hunting, and thus Dalby had the advantage over him in the latter department of art. Walter Shaw Sparrow, in his book British Sporting Art, states: …Dalby is to be liked … because he has a naturalness of expression, alert and wide-awake with sportsmanly observation. David died in 1836 and was buried at St. Michael Le Belfry Church, York. Examples of his work are in the following British collections: Walker Art Gallery, Liverpool; York Art Gallery, York and the Scarborough Art Gallery, Scarborough.